Plane passengers rarely describe air travel as a breath of fresh air, but it was literally that for one family's bulldog on a recent JetBlue flight. The French bulldog, named Darcy, was on a flight from Florida to Massachusetts on Thursday when she started showing signs of distress, according to his owner Michele Burt. The 3-year-old bulldog's tongue began to turn blue and she was having difficulty breathing. 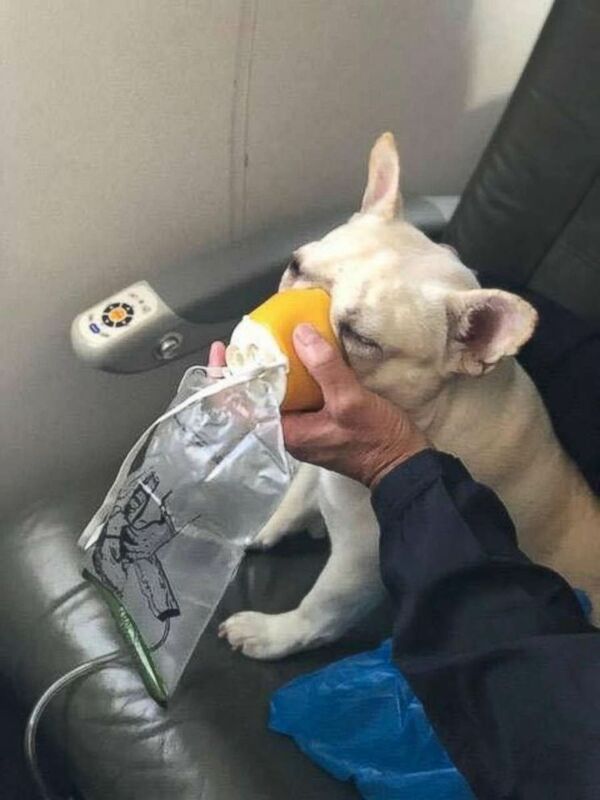 "We all are affected by cabin pressure and oxygen fluctuations, human, canine and feline, etc., but the fact that the Attendants were responsive and attentive to the situation may have saved Darcy’s life," Burt wrote on her Facebook page. 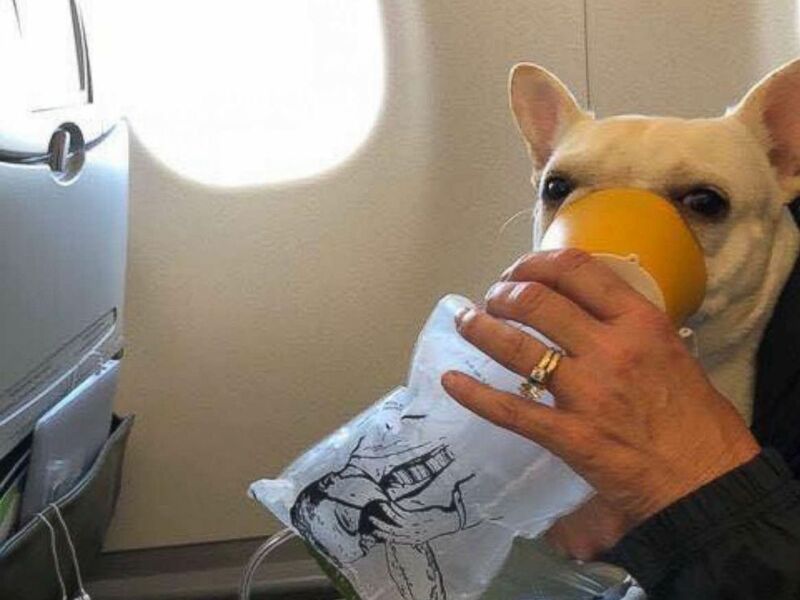 Darcy, the French bulldog owned by Steven and Michele Burt of Westminster, Mass., receives oxygen on a JetBlue flight Thursday, July 5, 2018. The crew came to the rescue with an oxygen mask for Darcy. The photos, which have since spread across social media, show the bulldog being treated for hypoxia. The photos are cute, but hypoxia, a lack of oxygen in the body, can be deadly. "I placed the mask over her face, and within a few minutes she became alert and after a short time she didn’t want the mask," Michele said. "I believe [crew members] Renaud and Diane saved a life, some may reduce the value of the life because Darcy is a canine, I do not." Crew member Renaud Fenster, who spoke to "Good Morning America" on Monday, said he'd "never seen anything like this" in his 15 years working for an airline. "I was passing through the cabin to check up on a passenger, and I noticed [another] passenger, who had the dog out of her crate and the dog had an indication that it wasn't looking too well. ... And I believe the dog passed out," Fenster told "GMA." "The dog started panting very rapidly and uncontrollably, and so as a French bulldog owner myself, I knew the dog was overheating and needed some ice. I brought the dog some ice, and that didn't do anything. "I decided that we needed to consider using oxygen to support the animal," he continued. "So I called the captain, and I told him, 'I think I need to use some oxygen,' and he said, 'Go ahead.' And right then and there, placed the oxygen on the dog and the dog revived like nothing else." 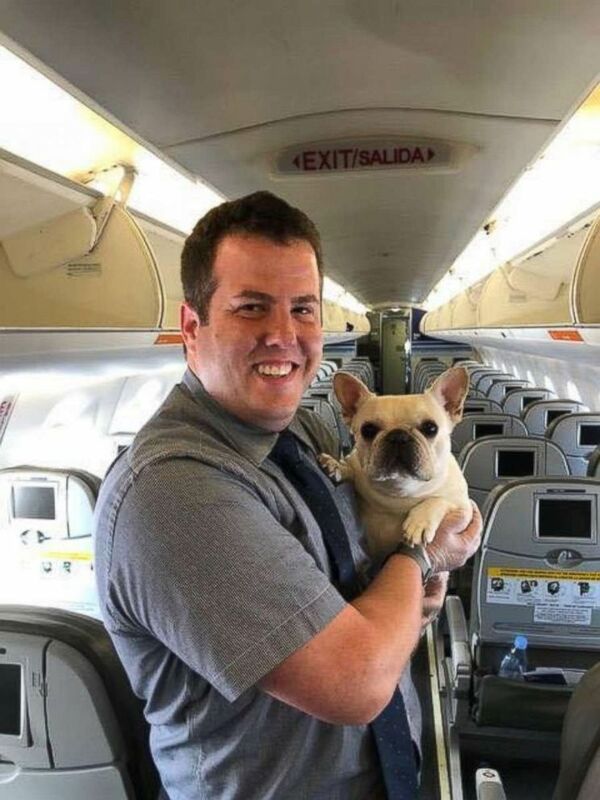 One of JetBlue's flight attendants poses with Darcy after the bulldog received oxygen on a JetBlue flight Thursday, July 5, 2018. Michele thanked JetBlue for its attentiveness to Darcy and wanted to remind people "that good people are doing good things on a daily basis even if it is in small ways or big ways." "We all want to make sure everyone has a safe and comfortable fight, including those with four legs," JetBlue said in a statement to ABC News. "We're thankful for our crew's quick thinking and glad everyone involved was breathing easier when the plane landed in Worcester." The owners snapped a photo of Renaud posing, smiling, with Darcy before getting off the flight. ABC News' Rex Sakamoto contributed to this report.